Last week, the Beauty Bloggers of Central Florida were invited back to Neiman Marcus Orlando for a special Guerlain & Champagne event. Guerlain kindly introduced us to their fall line. This line is being launched first at Neiman Marcus. I scored as a Femme D'Amore. 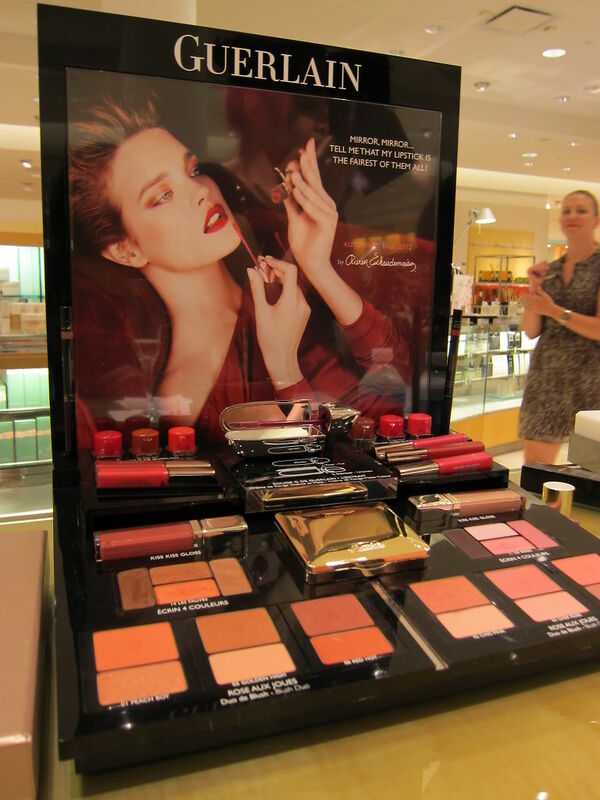 The left side of this display represents Femme Fatale. The shades and color range here are rich and saucy shades. The right side of the display featured Femme D'Amore. These are softer and more romantic shades. I actually love both Femme Fatale and Femme D'Amore there is certainly something for everyone and every occasion. The highlight of this collection were definitely the Rouge G L'Extriat lipsticks. These are semi-matte lipsticks. They had a range of shades from vampy, bright, soft, to neutral. We all go to try some of these shades! 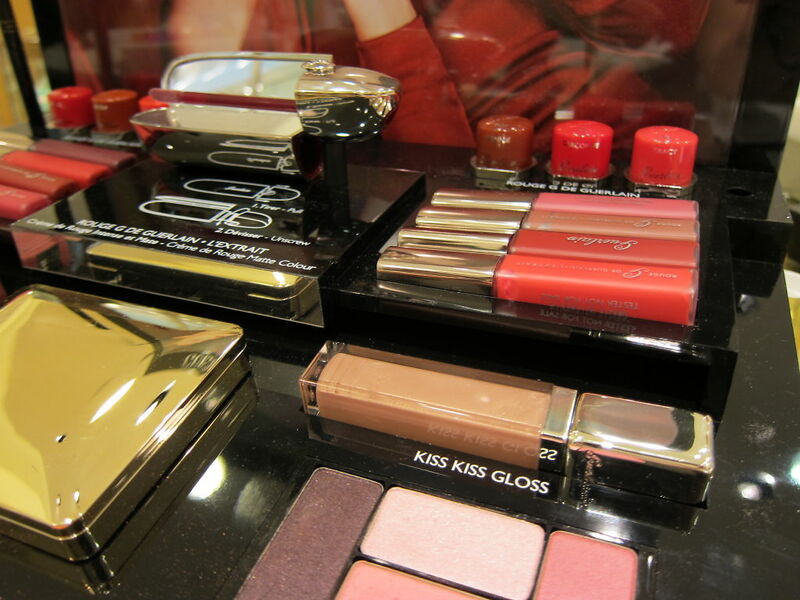 The collection also featured some new Kiss Kiss Glosses, blush duos, and some eyeshadow quads. This was a a very fun event. It was neat to see what is up and coming in fall as far as color schemes and finishes. 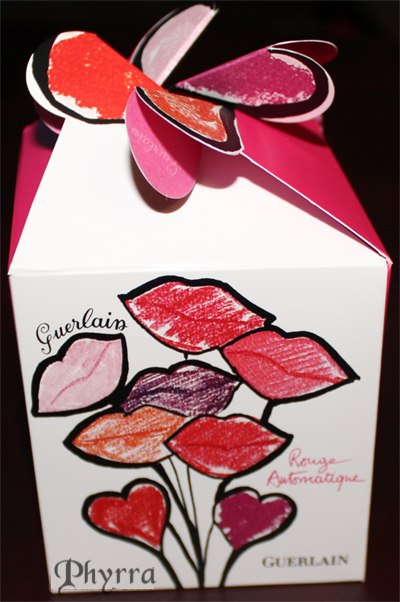 On the way out we received a little gift box with some Guerlain skincare products to try! Guerlain is having an event from August 6th-11th at Neiman Marcus. They will be doing facial treatments, color application, and a presale of the new fall collection. If you make any purchase during this event you get complimentary mini bottle of Guerlain Shalimar perfume. 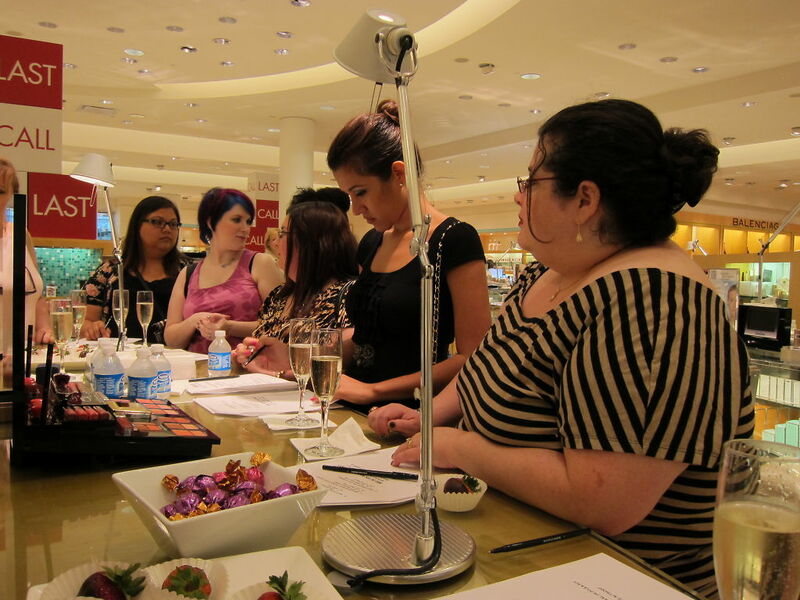 Many thanks to Neiman Marcus Orlando for inviting the Beauty Bloggers of Central Florida to this Guerlain event! We have all done it. We've bought polishes for very silly reasons. One of these reasons usually pertains to the name. The name is just too darn cute or funny we can't pass it up. This is how I felt about this JulieG polish. The color did appeal to me, but the name was the selling point! Cupcakes and Castles is a sheer baby pink with a subtle aqua microshimmer. Seriously? 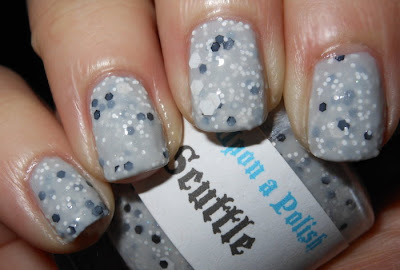 How could I not have a polish called Cupcakes and Castles? The name itself evokes happy rainbows, clouds, sparkles, and fuzzy panda bears. Yes, panda bears. I really love this color. The best part about it is that it is build-able. I used 3 coats here, so it's not one of those sheerer pinks you'll be painting on endlessly in hopes that it will be your last coat. This is cooperative! I also really love this subtle microshimmer. I like the contrast of the aqua with the pink. It gives this polish some personality. There were so many great things to share with you from this past week! feedkmayeorchids shares with us her "Summer Grapefruit" nails. 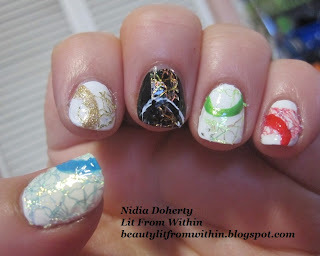 Nail Polish Wars shows us her KKCenterHK stamping plate manicure. 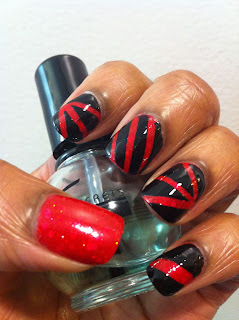 Ishah x Beauty shares with us her saran wrap manicure. Sweet Sugar shows us her blue-green gradient tape manicure. Gotham Polish shares with Deborah Lippmann Nefertiti and Egyptian art at the Met. 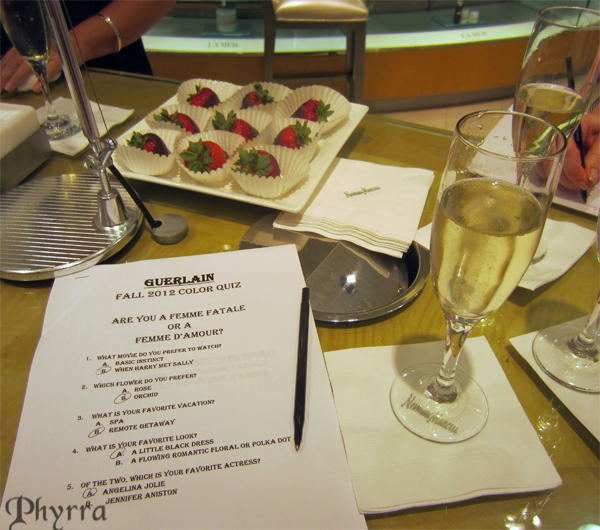 Lacquered Lover shares with us her adventures at Cosmoprof (post 1, 2, & 3). Fingers Painted swatches Amy's Nail Boutique Woodsie's Wish. 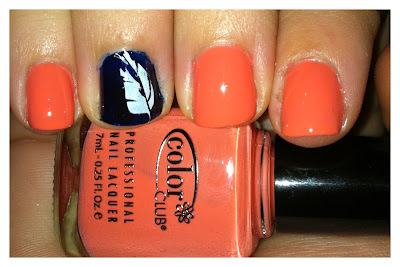 Kelsie's Nail Files shares with us her Olympic manicure. iHeartPrettyPolish shows us her owl cake. Liquid Jelly teaches us how to create sailboat nail art. Make-up/Music/Money/Me shares with us some more one-word beauty reviews. The Lacquered Lady swatches China Glaze Adventure Red-y. Life in Color! swatches Cult Nails Feel Me Up. Sweet Sugar shows us her summer hibiscus gradient nails. I'M FEELING NAIL-VENTUROUS show us her gradient tape manicure. Manicure Description: This manicure is the US flag in various components. On a few nails, I painted a red base color then white stripes on top. On one nail, I painted it navy then stamped on some white stars. I drew the American flag on two of my nails on my right hand. I usually do this manicure for the Fourth of July. The polishes I used were Essie Midnight Cami (navy), Konad stamping polish (white stars), OPI An Affair in Red Square (red), Color Club White Striper and Essie Blanc (white). Favorite Summer Olympic Sport: My favorite sport in the Olympics is Gymnastics, because I love to see all the various routines. I think it's really cool how the girls (and guys) do the moves all strung together. 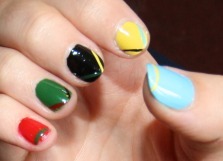 Manicure Description: The Olympic Rings, using Depend - 246, H&M - Yellow, ESSIE - Licorice, L`oreal - Green Couture, and Red Nail - H&M. Favorite Summer Olympic Sport: I don't watch sport, but I love running and cycling marathons. I'm still accepting Olympic themed manis through August 11th. If you want to submit one you can find info here! I may know a thing or two about nail polish, but when it comes to other things beauty I am pretty lost. I actually find makeup very intimidating. I have skin concerns that I find embarrassing, and I need help in finding products to help me. I have issue with facial redness. This becomes really apparent in summer when it's hot. It also is a problem when I'm nervous or anxious. The problem I'm noticing is when I do outings with beauty bloggers here, my face gets REALLY red. I know a lot of it is because I do get anxious in social situations, but I really can't control it all. A lot of the time I don't really feel nervous emotionally, but I have the physical effects of anxiety if that makes sense. It looks horrible in pictures, and when I look in the mirror I'm absolutely horrified. Majority of the time I may have bit of pink to my complexion, but nothing like this. It is embarrassing. I think I may have rosacea, but I really don't have the money to go see a dermatologist for something that really isn't serious. I don't know what to do about it. I don't know if something in my skincare routine or makeup routine will help cover up the redness or help ease it up a bit? I'm currently using Bare Minerals Matte Foundation. I've used it since 2005, but I don't think I'm getting great coverage from it. I would be interested in trying a new foundation. My major skin concerns are redness, oiliness, and I have sensitive skin. Any suggestions out there? I'd prefer something under $40. As far as skincare goes I have this Claudia Stevens Redness Relief cream I use. I've been using since April, and I haven't noticed any difference. Any suggestions on a skincare product that helps with redness? I'm at desperate point here, so I may consider something pricier. I'm not willing to spend over $60 though. If this helps these are some other skincare products I use. I don't use all of these at once, but I use a variation of these... Philosophy Purity Cleanser, Philosophy Microdelivery Exfoliating Wash, Garnier Moisture Refreshing Gel Cream, and Biore Night Boosting Serum. Any advice or suggestions would be appreciated! Thanks guys! The time has come! I have been looking forward to the Olympics since the beginning of this year. I love the Olympics. I love the world coming together to compete in friendly games. I love athletes stories. I really have zero interest in mainstream sports they play in the USA where players get million dollar salaries. Boo. I like a story and heart. The athletes in the Olympic games have trained for years, and to compete in the Olympics is often their ultimate dream. It's so inspiring. I got to go to some events in the 1996 Atlanta summer Olympics. I was only 10 at the time, but I remember and loved all the excitement about being there. I remember we got to see a basketball game, a baseball game (no longer an Olympic sport), and a table tennis match. They were certainly not the most highlighted events of Olympic games, but it very cool nonetheless. We stayed at my grandma's house at the time, and I'd stay up all night watching the replays of the gymnastics events on her TV in to the wee hours. I thought Dominique Moceanu was the coolest girl ever back then. So, yes my love for the Olympics goes back! Enough jibber jabber! Here is my patriotic manicure for the day. Glitter Glory is a mixture of red, white, and blue glitters in a clear base. I'm all set nail wise for Olympics! I also love the opening ceremonies and closing ceremonies. I'll be glued to that tonight. The parade of nations is definitely a highlight for me. Whew! Can you tell I like the Olympics? Will you be watching the opening ceremonies? What are your favorite summer Olympic sports? My favorites are gymnastics, diving, swimming and track & field. P.S. You can still submit your Olympic manis to me up until August 11th. I'll be featuring them in the next 3 Sundays "Share with You Sunday" posts. If you're interested in submitting the directions are here. I want all the bright blues! Yes, I think I've been going through this bright blue phase since early spring. I need them all! Thankfully there are many options out there. I really love LA Girl polishes. They have a several different collections with various colors and finishes. There is really something for everyone in this brand. The problem with LA Girl? I can only find them online. I do think they sell a few at Rite Aid, but as we know there are not any Rite Aids in Florida -moment of silence for this-. I picked this LA Girl bright blue recently on Cherry Culture. Deejay is a bright blue creme. This is a great blue, and for $2.50 a bottle you'll be pleased. This one is from the Disco Brites collection, which I love. I adore Hustle from this collection too. There are so many great colors in this collection, and I'm planning on getting more. The formula on this was great, and I found it very easy to apply. Awesome blue! I think every girl needs a good mint green or aqua blue in their arsenal of nail polish. I don't just mean nail addicts, I mean all girls. This is such a great color on the nails. I actually think it should be a staple like a red or a pink. It's very wearable, fun, and a great color on everyone! This is one of the newer Megalast colors by Wet n' Wild. I Need a Refresh-Mint is a light aqua blue creme. This is a dupe for China Glaze For Audrey, but if you don't have For Audrey I'd go with this one because it's cheaper at $2. I wouldn't say this minty, it's definitely more aqua. The formula on this was superb. I loved it. What I did not love was the brush. I have heard stellar reviews on the brush on this and not-so stellar reviews on the brush. I think it boils down to personal preference. The brush on this is thick and wide. You could easy cover your nail in one swipe. I had a hard time angling my brush correctly near my cuticles, so I had uneven application there. I prefer thinner brushes where I feel I have more control. This is just me though, and some of you may love the brush or hate it. It's your call! *I received this product to review from Wet n' Wild. Rite Aid, will you please come to Florida? I think those of us without Rite Aids in our area are really missing out. They seem to have quite the selection of brands that other stores like Walgreens and CVS don't have like Jesse's Girl. JulieG polishes are made my Jesse's Girl, and quite a few caught my eye. My parents were kind of enough to pick me up some of these while they were in California last month. This color is unlike any other I've seen. 9 to 5 is a bright pastel cantaloupe-orange creme. Is this color weird or what? It does absolutely wonky things with my skin tone, but I can't help but love this color. I do not own any other colors like this or even close this. I can't even think of a color similar to this. It is really very unique. I thought the formula on this was average, what I'd expect for a drugstore polish. It was a bit tricky considering it is pastel, but nothing I was not expecting. Cool polish for sure! The JulieG line has a handful of really great color polishes, and so does Jesse's Girl. I so wish I had a Rite Aid here. I would love to have more access to this brand. You can order these online from the Jesse's Girl website. They are $3.99. I'll probably take advantage of that in the future, but shopping in person is so much more fun! P.S. JulieG is a makeup guru on Youtube. I remember watching her videos back in 2008. She mentioned nail polish in her videos back then, and it caused me to take a second look at nail polish. I can't credit her completely for my now undying love for polish, but her mention of it definitely propelled my interest! Believe it for not, I just purchased my first Brazilian polishes recently. I didn't have any prior to last week. You'd think since I've been a polishaholic for the past 4 years, I would of had my share of these already. Nope. There is no particular reason other than I wanted so many I decided to keep them out of sight and out of mind to save my poor wallet. That being said, when my birthday came around last week I decided to use it as an excuse to buy some. This was one of the Jade holograifo polishes I picked up. Delirio Rosa is a bright pink linear holo. I would not call this hot pink or neon pink. This is just a bright pink. That being said, I do not know of any other holos out there in this shade of pink. This is amazing. 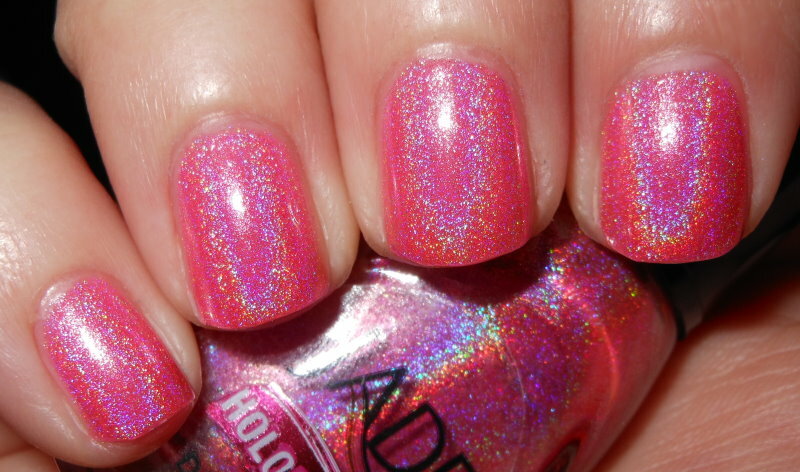 You usually see paler pink holos or pinks leaning towards magenta or fuchsia holos. I haven't really seen a true pink holo. The holo is strong. I loved the formula on this. 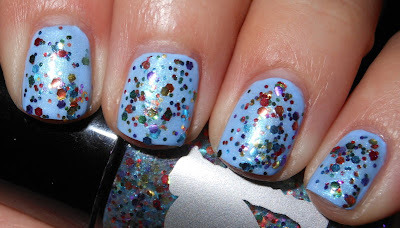 I typically find myself having to use Nfu-Oh Aqua Base before applying holos, but this did not even need that. It applied smoothly and evenly without any effort! Awesome polish! I definitely recommend it to holo fans out there. 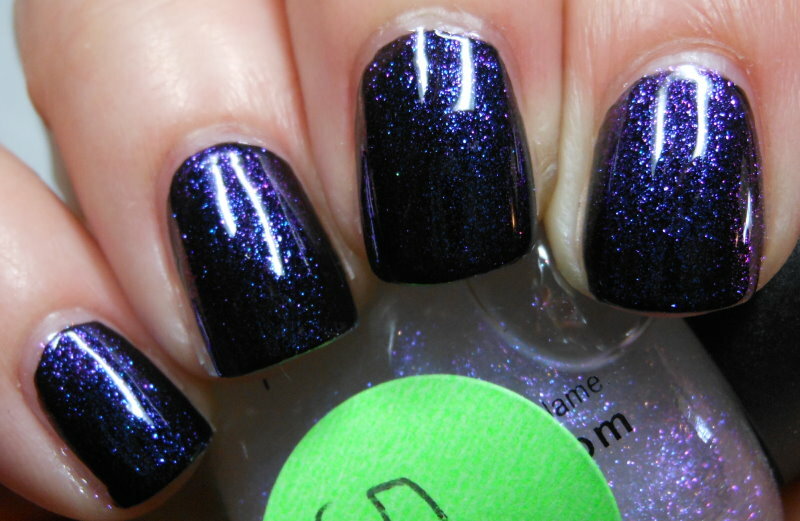 It looks like good holos are finally making an appearance in the mainstream nail scene. It looks like China Glaze will be treating us to a new holographic collection next summer. It doesn't look like it's going to be those sorry excuse for holos Techno collection holos either. 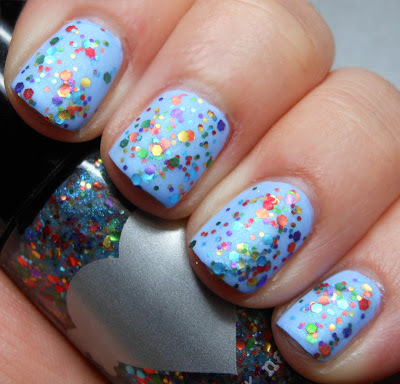 These look like the OMG collection holos with more color options. I suggest to start saving up your money now! 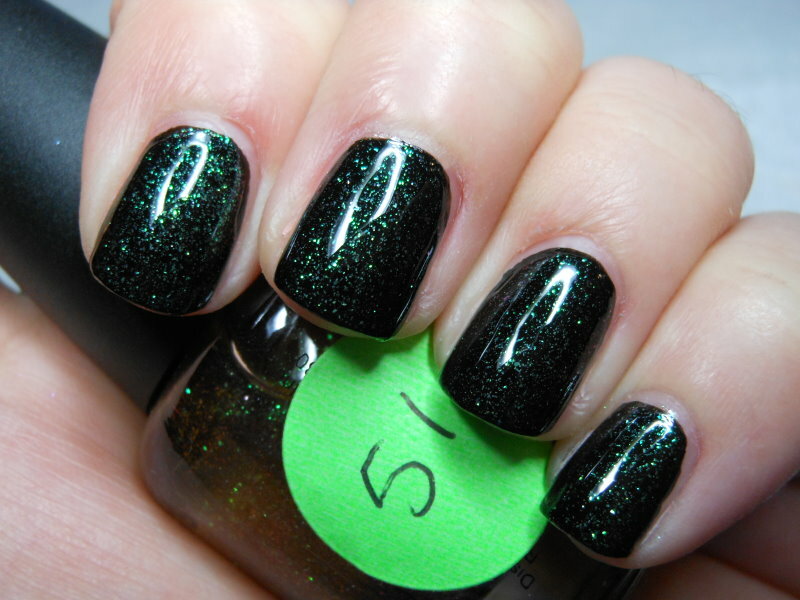 I got this polish along with other Jade polishes on Ninja Polish. Thank you guys for your comments on my post yesterday! I'm going to get back to all of you either tonight or tomorrow! My Result: You try to observe the world rather than judge it. You feel like you are here to learn. You see every side to people. You know that things are complicated and nuanced. You have trouble getting along with people who are flippant or silly. You crave substance. You connect best with philosophical, thoughtful types. Your friends care about ideas. Share your result in the comments! Jessica's Nail Tales shares with us her manicure inspired by her favorite beach towel. Caitlin's Creative Corner shows us her teal 3D nail art. Chalkboard Nails shares with us her blinged out leopard nails. Frazzle and Aniploish shows us her the late July nail displays. Goose's Glitter swatches Dollish Polish Toxic Avenger. Geniabeme Beauty Blog swatches some new Class of Sation nail polishes. Crazy Nail Lady shows us her "Hooo's your momma?" nails. Lacquer of Leave Her! shares with us some fishtail braid nails. Polishy of Truth swatches Dollish Polish Expecto Patronum. Manicure Description: I started with a jelly sandwich which I created with Funky Nails Vibrant, a beautiful red jelly, and OPI Pirouette My Whistle. I used my French Tip Guides to create a stripe pattern. I then added a coat of NK Noir, a black creme, and added Beauty Secrets Top Coat. I decided to leave my thumb with just the jelly sandwich. Favorite Polishes: Revlon Whimsical, The Hungry Asian Mint Condition, Revlon Royal Cloak, and Essie Meet Me At Sunset. Manicure Description: A tribute to all things girly. I used two coats of Recycle - China Glaze, and one coat of Dazzle - Savina. Using BM plate 303, and a nail art pen to write XOXO over one nail. **I need Olympic themed manicures for next Sunday, August 5th, and August 12th. You can find information on how to submit your Olympic themed manicures here. Spontaneous Saturday: I'm An Introvert. I think one my biggest revelations in the past 2 years is that I'm an introvert. I know I've always been an introvert, but there are various occasions in my life where I made to feel shameful for being one. There were also times in my life I tried so hard to be an extrovert that I had no idea who the hell I was anymore. This is the first time in my life I'm starting feel comfortable being introverted, and I'm recognizing there isn't anything wrong with it. Sadly, I think we live in world where introversion is often associated as being a negative trait. I was shy and quiet growing up at school. I had many teachers that wrote notes on my report card about how shy I was, and how I needed to work on making more friends and being more outgoing. I really resent a lot of this now, because if these teachers had only got to know me as an individual they really could of seen my potential and helped me grow as person. These teachers instead passed judgement on me and forcefully pushed me into extroversion. I am so thankful for some of the wonderful teachers I did have who identified my quiet nature as someone who is an profound thinker, and encouraged me to explore my mind, creativity, and thoughts more. I do think that the negative outweighed the positive growing up, and since I got more negative messages than positive ones, I eventually just assumed that my introversion was bad. 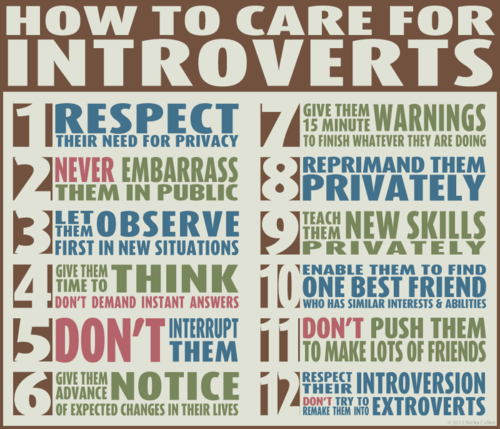 This lead to me want to try to be an extrovert, which was an epic fail. The busy and exciting outside world of an extrovert is what an introvert has on the inside. There are probably countless things running through my head at any given moment. It's hard to express to people what is going on in my inner world, and that can be frustrating. I live very internally, I'm sure people I encounter notice this about me. I really take everything in. I make observations. I like to get a feel for people and my surroundings. I'm sure this translates as being shy, but it's more that I'm just processing my environment. I'm never going to be someone who is going to have a huge social circle. I can never walk into a social situation and be the life of the party. Honestly, I find social functions draining. I do much better one on one with people. I'm not much for small talk or random chitter chatter. It's painfully difficult for me. I like to make connections with people. I like to relate, share, and really get to know people. This means I have a smaller circle of friends, and it probably takes me awhile to gain new friends. I've really pushed myself into more social situations more recently. I'm not doing it so I can be more outgoing, but so I can expose myself to more people, and hopefully gain more close-knit friendships. I also recognize I am hard to get to know. I do not let people in very easy, and the people I do let in...consider yourself very lucky! What's funny about that is that I do not even feel the slightest bit of discomfort being open on my blog. When it comes to real life situations though, I am very much a closed book. I think this is part introversion, and part my personality and insecurities. I really am a complex person. I have so many levels and layers, and I don't want everyone to have access to them. I definitely need my space and quiet time too or I start to not feel like myself. I have to get in touch with me to function authentically if that makes sense. Authenticity in myself and in others is probably a #1 priority for me. I'm very intuitive about this as well. I can spot a phony person really quickly. I'm sure these things attribute to the "hard to get know" factor about me. I want to be 100% honest about myself and I expect the same from others. In ways this is a good trait, and has helped me steer clear of toxic people. It's also not a great trait either,as I need to work on being more accepting of my own flaws and others flaws. Trusting others is very challenging. A lot of these things I'm describing, I used to hate about myself. I used to be so hard on myself for not being more outgoing, for needing to have my personal space, and for being so introspective. I never realized how much these traits benefit me. I realize a lot of these aspects of my personality are assets. I've made more friendships and I've made stronger ones. I decided to pursue my dream to be a teacher rather than follow a path I felt I should of been doing. I've become more confident sharing this part of myself with others. The most important thing is I'm starting to comfortable with myself, and who I am. That is the most rewarding. It's certainly not the end, it's a long journey ahead..but being the quiet and thoughtful one isn't bad! 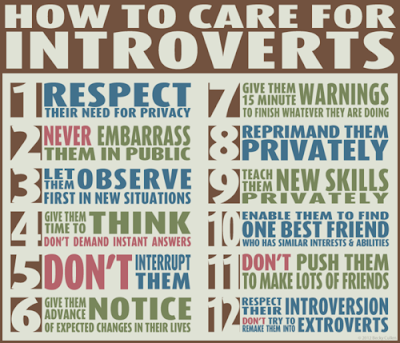 Are you an introvert or and extrovert? Care to share any of your feelings on this subject? P.S. I don't have anything against extroverts! I've been eyeing the Pixi Cosmetics polishes over at Target recently. The problem with these polishes is you only get .25fl oz, and they are $8 a pop. The problem with that previous statement is the colors I've been eyeing are irresistibly gorgeous, and I couldn't help myself. I did have a $2 off a Pixi cosmetics item purchase that I got in my coupon booklet from my Target beauty bag, but that didn't stop me from 2 other polishes besides for this one. No self control, but I think it was warranted. The color I have for you today is AWESOME. 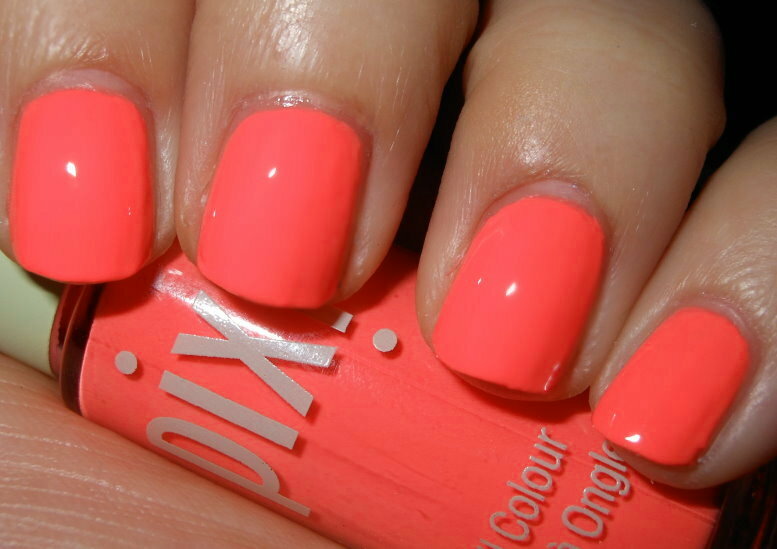 Coral Cabana is a neon/bright coral creme. This baby is bright! I'd actually say this is a neon. That being said, I wouldn't say it's as neon as some other neon colors out there. I am in love with this color. I personally cannot think of any dupes. I just took out my bottle of China Glaze Flip Flop Fantasy, and Coral Cabana is lighter and not nearly as glaringly neon. I think Coral Cabana is definitely more wearable than Flip Flop Fantasy for those who might be hesitant about neons. The formula on this was average, I did find it could benefit from some thinner. This is not something I am pleased about when paying $8 for half of what we'd normally pay for a regular size bottle of polish. I do really love this color, it makes me think of radioactive cantaloupe. No regrets! It has a cozy permanent spot in my Helmer! Glitter Bombing Layering Birthday Fun! Today is my 26th birthday. That is kind of scary. I actually don't mind getting older, but how fast time goes by these days is scary. I remember being little and a year felt like the equivalent of what 4 years feels like now. A year now feels like the equivalent of 6 months. Does that make any sense? I haven't even had any birthday drinks yet, and I'm blabbering away! As I said I don't mind getting older. The older I get the more I am coming into my own. I'm starting to feel more comfortable in my skin, and the things in life that used to terrify me don't bother me as much. So, I can't complain. I'm sure there so many people in the 30's, 40's, 50's, 60's, and so forth who want to slap people in their 20's for complaining about getting old. Puh-lease. 20's is not old! Here is my birthday mani! This was a layering experiment. It is 1 coat Orly Androgynie, 2 coats Butter London The Black Knight, 1 coat Rainbow Honey The Worst Possible Thing, and finally 1 coat of Hits Phenomena Afterglow. This is so awesome! I need to layer glitters more, you can really come up with some neat results! I don't have really any big birthday plans. I think a nice dinner, cake, and some shopping will be in the cards. My boyfriend has made it a tradition every year to bake me a cake. He's not a baker or anything, but they're always delicious and it's sweet of him to do it. I was having issues coming up with today's topic. This is a more light-hearted one, but I'm curious to know how you other bloggers out there swatch and blog. This is what I accomplished today. Some of these I was swatching for the blog, others I was testing out layering combinations. I have a habit of letting my swatch pile build up for weeks...sometimes months. The only things I try to swatch ASAP are stuff I receive for review. I don't think this is the most practical way I can swatch stuff for my blog at all. I'm sure most of you know, the polish I have on my blog one day is rarely the polish I'm actually wearing. I really only do my nails 2-3 times a week max. This used to be different, I used to them every day or every other day, but my time has become more limited. I always end up letting new polishes pile up, and then when I have a free day I sit and swatch, and swatch, and swatch. This last batch I was swatching from 10am-5pm, with a 30 minute break. This is always accompanied by catching up on shows on the DVR or Netflix. It's funny because the swatch pile is absolutely daunting to look at (which has caused me to put it off), but when I start swatching time goes by so fast. I really get lost in it. It is actually pretty relaxing. I do get to a point around 5 hours in where I have had about enough, and have to push through the rest. I clearly make this harder on myself than it needs to be. I'm just the type of person who when they start a project I have to finish it. It would probably easier if I had myself do 6 swatches of polishes every time I changed my nails, instead of swatching 30+ in one day. I'm stubborn though, and will still let my swatch pile build up for weeks on end, and spend 7 hours one day catching up on it all. It does feel like quite the accomplishment when I get through though. It's just the way I like to do it! How about you bloggers out there? How do you manage to do your swatches for your blog? If you were not aware, The Little Mermaid is my absolute favorite Disney movie. In fact, outside of my nail polish collection I do have a bit of an Ariel collection. I love Ariel. I first saw that movie when I was 3, and I wore out my VHS tape of it along with my cassette tape of the music. Don't worry, they were quickly replaced. I can attribute my love for swimming to The Little Mermaid. I was a fast learner and great swimmer when I was a kid. I know at summer camp they always put me in the highest level of swimming lessons, while the other kids my age were in the lower levels. Thank you to The Little Mermaid I probably will never drown. I'm rambling, back on the polish track. This is a polish from Once Upon a Polish. She released a handful of The Little Mermaid themed polishes. This one is Scuttle, and I must say she did a great job with it. Scuttle is sheer, yet buildable light gray base with a mixture of white, black, and micro iridescent glitters. I did notice this polish had these teeny tiny iridescent micro glitters. I thought that was a cool touch. This polish is really unique and fun. The gray base is great, it is on the sheer side, but I was able to build it up in 3-4 coats. It's certainly a polish I recommend you check out. It's very different than most indie polishes I've seen. Here is some Scuttle for you too! I wanted to share that my friend who made my blog header, has launched his design website Evander Designs and is open for business! He is personal friend of mine who I have known for over 6 years. He's very enthusiastic and talented when it comes to his work. If you're looking for designs for your blog or business I really recommend you check him out! I got a request to bring back the weekly quizzes, so I'm going to do that! I'm glad you all enjoy those! These are just silly and fun. What Flavor Iced Tea Are You? You are warm hearted and generous. You believe it's important to make others feel comfortable. You are a bit of a cozy homebody who feels out of place in the warm weather. You'll drink iced tea but you prefer the hot stuff. You are more serious than most, and you shy away from superficial people. You prefer to look beyond the surface. You like deep conversations, engrossing novels, and moving films. You find ideas and human interaction fascinating. Sounds like me, but I do actually prefer iced tea to hot! Colores de Carol swatches the MASH Scented Neon polish set. Life in Color! does comparison post using Zoya Wednesday. 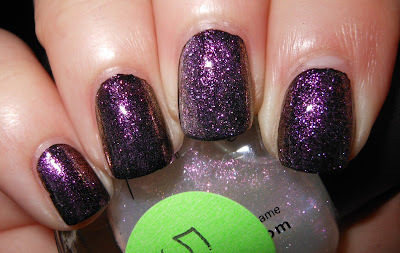 Neverland Nail Blog shows us her purple gradient with silver holo glitter nails. Glam Polish swatches BSJ Holo #13. Refined and Polished swatches Pretty & Polished Phat Camp. little nails shares with us her gold & green chevrons and spots nails. Sweet Sugar shows us her first manicure using saran wrap. The Lacquered Lady swatches some polishes from a new brand Polish & Co.
Manicure Description: This manicure is the first "dotticure" that I tried. I based it on my pencil case and used lots of different colors. The base is OPI My Pointe Exactly, the red is Rimmel Stiletto Red, the yellow is Misa Happy Happy, and a few others that I can't remember right now! Favorite Polishes: OPI Rainbow Connection (I'm a sucker for that song! ), WnW Black Magic (the original with the multi bar glitter, a England Saint George, Cover Girl Mystic Peacock, and China Glaze Recycle. Favorite Polishes: Cult Nails Unicorn Puke and I'm pretty sure I will be ALL OVER the Coco's Untamed Collection when I finally get it! Blog: None yet, but I am on Pinterest (Rebecca Lynne)! I put a lot of my manis on there. I do not have any manis for next week! You can find information on how to submit your manicures for Sunday posts here. **I also need Olympic themed manicures for the days July 29th, August 5th, and August 12th. You can find information on how to submit your Olympic themed manicures here. Spontaneous Saturday: Don't Blow up my Nail Polish! Nail polish dreams? Have you had them? I think these dreams are a certain sign you're a nail polish addict. I've had my share of nail polish dreams. 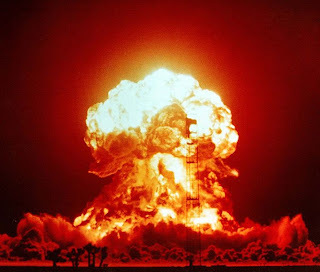 It's no surprise to my close friends and family that I have some of the most bizarre dreams ever. My dreams never make sense. They're never sequential. My dreams are truly ridiculous. I remember my first nail polish dream. It was a good one. In my dream, I was at Dollar Tree, and they had this whole aisle of nail polish. All of the nail polish there were HTF bottles and they were all a $1. I got shopping cart and stocked up on all the polishes, only to wake up a few seconds later. Not cool. That should of been real. Last night, I had nail polish dream or rather a nightmare. The dream started off making absolutely no sense and was not related to nail polish whatsoever. I was going to some Barbra Streisand concert. I have no idea why. I'm not really a Barbra Streisand fan, though I do catch myself singing the tunes from Funny Girl and Yentl in the shower. Anyways, my dream shifted into me being in the ocean with all these people doing some Survivor like race in a lifeboat to retrieve items. I started freaking out because I had not put on sunscreen. I get burned pretty bad in the sun, and I know how miserable it is to get sunburned. I was complaining about that, so all the people I was with started yelling at me because I was worried about petty stuff. Hello! Sunburns are can be dangerous! LOL. Then the dream shifted again. I was no longer in the middle of the ocean, but I was back at home with all these Survivor teammates laughing at me because of my nail polish collection. This one girl started tell me I could not tell the difference from a red shimmer and red glitter. That b****! This infuriated me. I started pulling out all my drawers of polishes and showing her examples of red shimmers and red glitters. I clearly remember showing her OPI Red Dazzle. This girl just kept antagonizing me, and she threatened to steal my polish. I then put one of my Helmer drawers down full of polish, and I heard her say I'm going to blow up all her nail polish. I saw her light a match. I screamed "Don't blow up my nail polish!". Then at that moment I woke up all amped up and startled! Phew! Just a dream! It's so silly. I never have really thought about how attached I am to my polish collection, but I'd be pretty bent out of shape if it was blown up! I also think from my dream I do have some insecurities about my nail polish love. I don't mind telling my family and friends about my polish/blogging, but new people I'm introduced to I shy away from telling them about my blog. I still certainly worry about being judged or made fun of (Ooo, this just gave me a good idea for a "Talk it Out Tuesday" topic). I'll leave it at that before I started talking about a topic more suited for Tuesday posts! Have you ever had nail polish related dream? What was it about? I must admit I have not partaken in the current My Little Pony fandom. I actually have never seen the recent adaptation of My Little Pony, but I have feeling I'm clearly missing out. 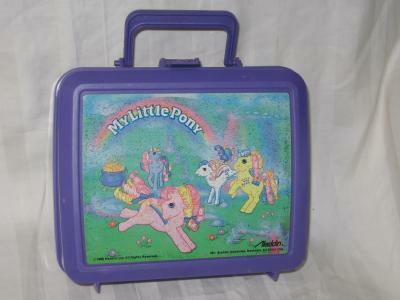 I was a fan of the early 90's My Little Pony Tales series though. My best childhood friend had a huge bin of my little pony dolls. She had ponies that if you squeezed their butts they said stuff like "Comb my hair! ", ponies that when you turned their head their tail hair would grow, ponies that changed color in warm water, baby ponies, mermaid ponies, glittery ponies, and so on. I was rather envious of this My Little Pony collection. Anyways, when I came across Rainbow Honey and her Equestria Collection (inspired by the current My Little Pony: Friendship is Magic) I knew I had to have some. I picked up a few in the presale. I have 20% Cooler to share with you today. 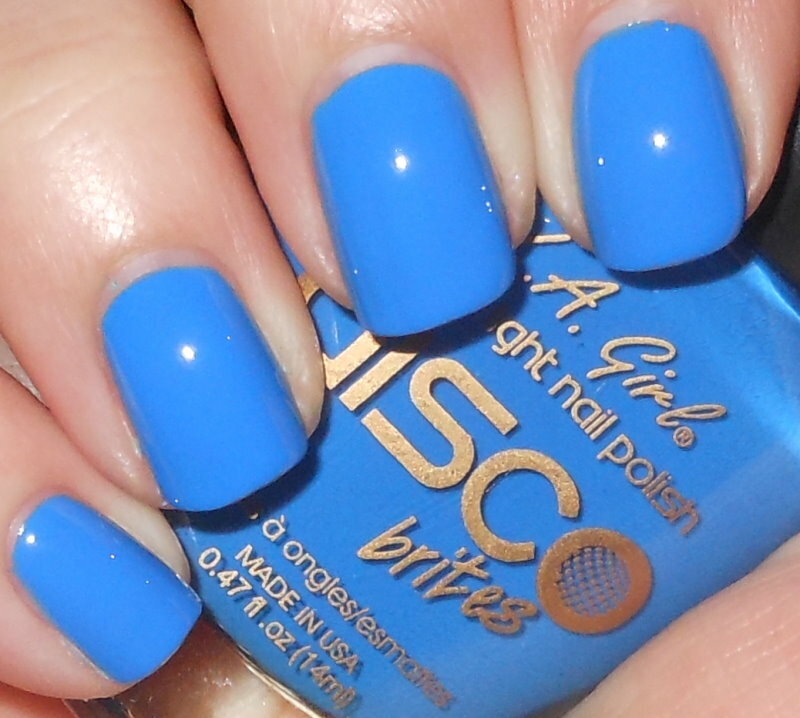 20% Cooler is a sheer shimmery blue base packed with rainbow glitter. 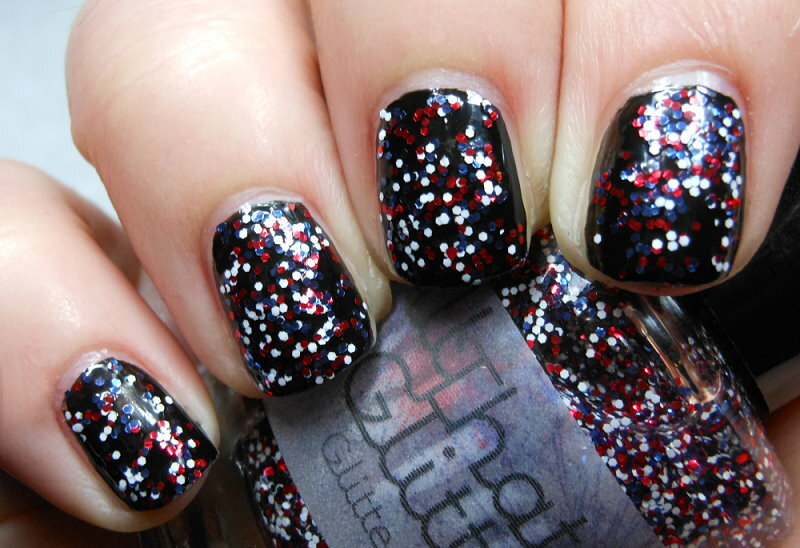 This is an amazing glitter polish. Come on now guys, you can't really go wrong with rainbow glitter! Right? I absolutely love this polish, and I have feeling it's going to make it's way to my favorites list. I think it looks amazing mattified too! 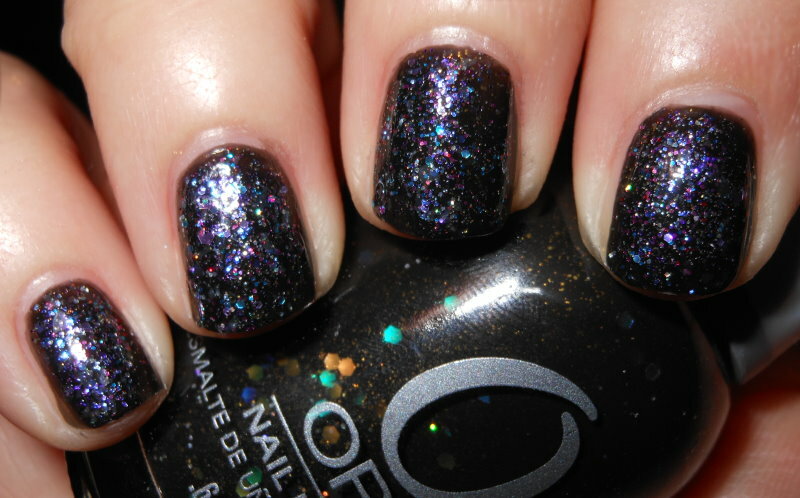 I love glitters like this matte. This is just an all around fun polish! On a side note.... I totally had this lunchbox in kindergarten with matching thermos. Is it sad I kind of want it now? I don't know if it's appropriate for a near 26 year old to be carrying around a My Little Pony lunchbox? 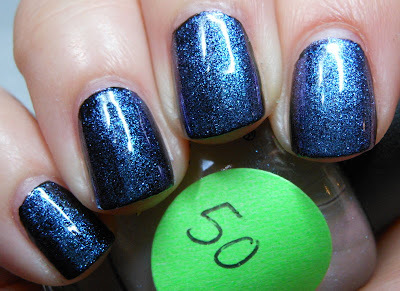 You can purchase 20% Cooler and other Equestria polishes from Rainbow Honey. Full size bottles are $10, while mini bottles are $5. She also is great about updates on her Facebook page. I have very few Essies, but the ones I have I truly love. I'm starting to get into the brand more lately. I'm enjoying their recent collections, and I absolutely love that they are retail. It's nice to be able to see them at the drugstore, it's even better when I have CVS Extrabucks I can use so I can take a few dollars off the $8 price tag! No More Film is a deep blue-violet creme. 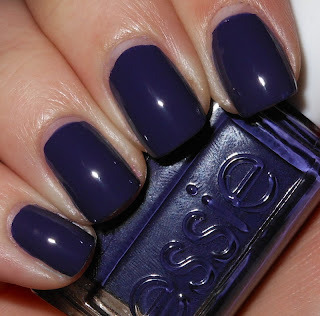 No More Film is part of the Essie 2012 Resort Collection. This is one of those colors that reads true in any lighting. It's not one of those that looks black on the nails. I love shades like this because they don't really scream a particular season. You could wear this easily anytime of year. I liked the formula on this too. It was smooth and easy to apply,and if you wanted you could get away with one coat. This color is very much channeling the grape flavored Otter Pop for me. Are you all familiar with Otter Pops? They're those frozen icy popsicle things in those long plastic tubes. Each color had a specific character otter designated to it. The purple one was Alexander the Grape. LOL, very silly I know. There is your bit of trivia and randomness for the day. 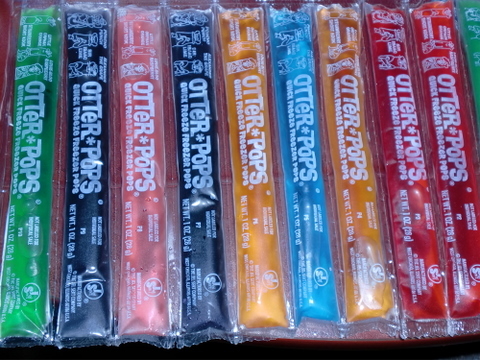 I now want some Otter Pops! I have some new color morphing pigments from Anna's Art Asylum to show you. You can mix these into clear polish to create awesome color morphing top coats or mix them into polish to give them a cool effect. This post is very pic heavy. I'll get right to it! 50 shifts from light blue to purple. 51 shifts from green to purple. 52 shifts from fuchsia to gold. 53 shifts from lavender to gold. 54 shifts from light green to blue. 55 shifts from green, gold, to purple. 56 shifts from blue to purple. 57 shifts from aqua to purple. 58 shifts from aqua to blue. 59 shifts from pink, green, to gold. These pigments are hit. Sadly, my camera cannot capture the true beauty of these pigments. They have very strong color morphing properties! The color morphing is very easy to see in person. You can purchase 5 of these for $25 in Anna's Art Asylum's ebay shop. You will get 1gram of each pigment, and this will give you enough to make a few bottles of polish depending on the size. I find these easy to work with too, which is plus! My top 5 are 50, 52, 55, 56, and 58. **These products were provided to me by Anna's Art Asylum for my honest review. I want to see your Olympic themed manicures!